Before the year is out, we’ve got parity yet again between both benchmarks. Right at the start of the year, the West Texas Intermediate briefly traded at a premium to Brent having achieved parity at $48.05 per barrel on January 15. Come the end of the year and we are here again! Parity between both benchmarks was achieved once more at a lower level of $36.40 per barrel on December 22 (see above, click to enlarge), exactly $11.65 lower with WTI in the ascendancy. In fact, the US marker's premium appears to holding. The OPEC stalemate, peak winter demand and lifting of US exports ban are and will remain price positives for the WTI, as one wrote in a Forbes column. So is this a reversal of the 'crude' pecking order of futures contracts we have gotten used to since 2010? The Oilholic feels its early days yet. However, the development sure makes for an interesting 12 months in more ways than one. Happy Christmas dear readers, but that’s all for the moment folks! Keep reading, keep it ‘crude’! © Gaurav Sharma 2015. Photo: Bloomberg terminal screen grab showing moment of Brent-WTI parity on December 22, 2015 © Bloomberg. It has taken 40 years but US politicians finally found the timing, inclination and effort required to get rid of a legislative relic dating back to the Arab oil embargo of 1975 – a ban on exporting the country's crude oil that has plagued the industry for so long for reasons that no longer seem relevant. Late on Friday, when news of the lifting of the ban arrived, the Oilholic could scarcely believe it. As recently as July 2014, this blogger opined in a Forbes column that movement on this front was highly unlikely until after the US Presidential election. However, in this instance, one is both pleasantly surprised as well as glad to have been proved wrong. US producers, including independent upstarts behind the country’s shale bonanza, would now be able to sell their domestically produced barrels out in the international market competing with those already having to contend with a global supply glut. Let's not kid ourselves, lifting of the ban would not necessarily lead to a significant spike in US oil exports over the short-term. However, it at least levels the playing field for the country’s producers should they want to compete on the global markets. 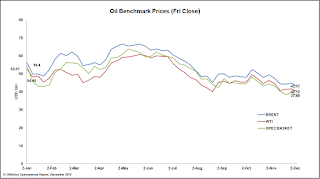 It is also price positive for WTI as a crude benchmark leading it to compete better and achieve parity (at the very least) with global benchmarks in the spirit of free market competition. Of course, in keeping with the shenanigans long associated with political circles in Washington DC, lifting of the ban came as part of a $1.1 trillion spending bill approved by the Senate that will fund the government until 2016. The spending bill also includes tax breaks for US solar and wind power, and a pledge by both errant Republicans and Democrats not to derail a $500 million grant to the UN Green Climate Fund. No matter what the political trade-offs were like, they are certainly worth it if the reward is the end of an unnecessary and redundant ban. That’s all for the moment folks! Keep reading, keep it ‘crude’! Having been to every single OPEC ministers’ summit since 2008, the Oilholic thought he’d seen it all. Not quite it seems; when the 168th meeting of ministers ended – for the very time since yours truly had been here, the oil producers collective failed to mention its production quota. Here’s a link to the communiqué on December 4, that's historic for all the wrong reasons! In farcical fashion the market was left guessing what OPEC’s actual production is based on previously published data and anecdotal evidence. OPEC itself puts the quota at 30 million barrels per day (bpd). Until recently, while Saudi Arabian production was in overdrive, 31.88 million bpd was the industry consensus, and barely days before the OPEC meeting convened a Bloomberg survey put the figure at 32.1 million bpd. Bulk of the incremental OPEC barrels are coming from Saudi Arabia and Iraq, with discounting by all 12 members in full swing, as the Oilholic wrote on Forbes. Now Iran, eyeing a meaningful return to the international fold, is also not in favour of production cuts, unlike on previous occasions. It is not just the analyst community that is in uncharted waters, the producers’ group itself appears to be pretty dazed. OPEC has not published a target oil price since 2004. Then in December 2008, it ceased publication of individual members’ quotas leaving the market to second guess the figure. All we know is that Iraq and Libya are currently not included in the headline quota. 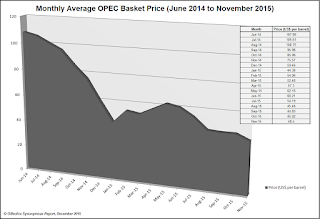 Now it seems OPEC will not even reveal what its daily production target is. It is all pretty strange and quite unlike any cartel in the world, if you feel OPEC should be described as such. No slide rule or calculator was required in working out the stalemate in Vienna would be short-term bearish! There’s just too much oil in the market. In fact, latest surveys suggest we are seeing nearly 2.6 – 2.9 million bpd of surplus oil, double of 1.3 million bpd estimates earlier in the year. At this rate it would be well into 2016 before supply adjustment occurs, which means that oil price will remain in lacklustre mode. Only saving grace is that a steep decline for Brent below $40 per barrel was not a high probability unless there is a global financial tsunami; even though the global proxy benchmark did briefly fall below the 40-level in intraday trading today. 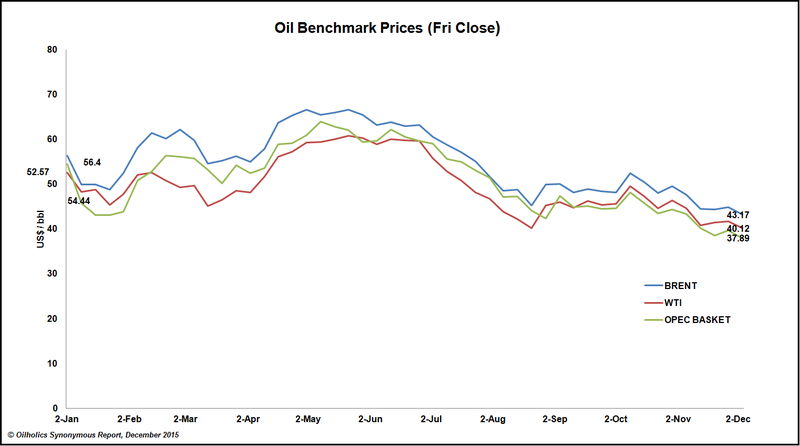 Expect an uptick next year, but the undeserved oil price heights of Q1 2014 won’t be touched anytime soon. That’s all from Vienna folks. Keep reading, keep it ‘crude’! © Gaurav Sharma 2015. 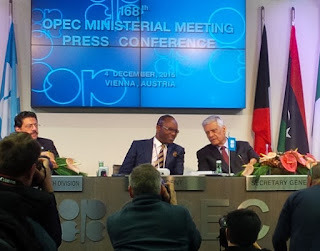 Photo: OPEC Secretary General Abdalla Salem El-Badri (right) at the conclusion of the 168th OPEC Ministers Summit in Vienna, Austria on December 4, 2015 © Gaurav Sharma / Oilholics Synonymous Report, December 4, 2015. The Oilholic is still gathering thoughts on a most unusual conclusion to the OPEC meeting here in Vienna, with the formal communiqué issued by the member nations making no mention of the official production quota but noting that its members had opted to keep production where it was. So the only thing that's clear - minus an actual figure - is that OPEC will keep on pumping and maintaining its line of holding on to its market share. Having since waited for the US close, and done the relevant calculations, both Brent and WTI shed over 3% based on a five-day, week-on-week basis, with short-sellers predictably all over both futures contract. 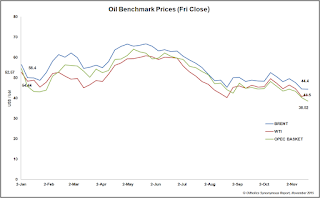 Using 2130 GMT on Friday as cut-off point, Brent was down $1.70 or 3.79% to $43.17 per barrel compared to the charting point last week, while WTI was $1.35 or 3.23% lower at $40.12 per barrel (see chart above left, click to enlarge). Get prepared for short term bearishness! Finally, here is how far the OPEC oil price basket has plummeted since June 2014 (see chart below, click to enlarge) More from Vienna shortly; but here is some initial reaction in one’s latest Forbes report. Keep reading, keep it ‘crude’! © Gaurav Sharma 2015. 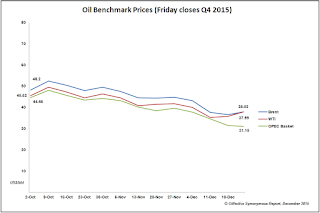 Chart 1: Oil benchmark prices Jan to YTD 2015. 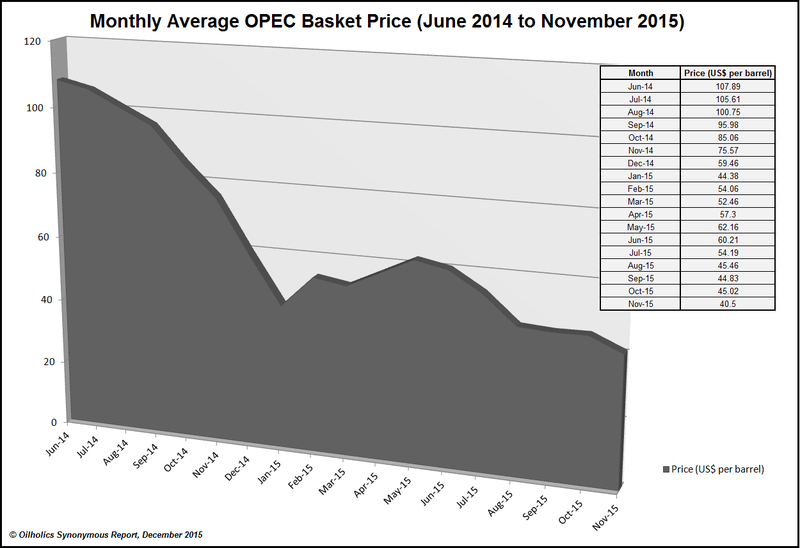 Chart 2: OPEC Oil Price Basket June 2014 – November 2014 © Gaurav Sharma / Oilholics Synonymous Report, November 2015. OPEC decided to roll over its 'previous quota' published at 30 million barrels per day, but declined to put a figure in its official communique issued at the conclusion of its 168th ministers' meeting in Vienna, Austria. Despite repeated questioning on the quota ceiling, OPEC Secretary General Adalla Salem El-Badri said Indonesia's re-entry into the OPEC fold, additional Iranian barrels entering the market and concerns over economic growth meant putting forward a quota figure needed further consideration. "OPEC will wait and see how the market develops" over the next six months and saw no need to alter the current production level during a period of market adjustment, he added, having been asked to stay on as "acting" Secretary General until July 2016. In wake of the OPEC announcement, at 1656 GMT, WTI was trading at $40.47 per barrel, down 61 cents or 1.48%, while Brent came in at $43.52, down 32 cents or 0.73%. 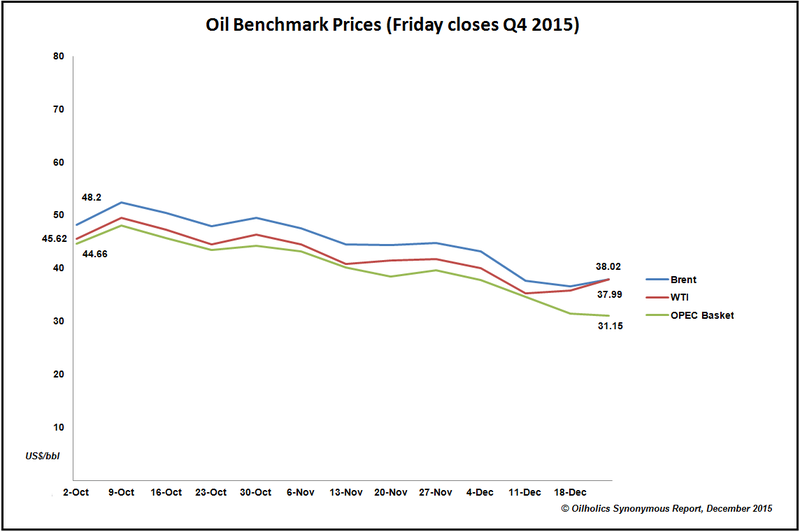 Industry surveys suggest OPEC's production for November was at 32.1m bpd, well in excess of stated levels. More shortly! Keep reading, keep it ‘crude’! © Gaurav Sharma 2015. Photo: OPEC logo © Gaurav Sharma. It’s not official yet, but highly likely that an OPEC quota cut is not on cards as the Saudis won’t budge and the Iranians, hoping to return to the international fold, aren’t keen on a cut either. That’s unless other non-OPEC producers, most notably the Russians come on board too. It is the latter part that’s the tricky bit. It ain’t happening at the moment, but could it happen at some point 2016? Not likely, says our old friend Jason Schenker, President of Prestige Economics. "They might meet and greet, talk on the sidelines. But chatter of a possible joint policy announcement [with Russia] seems pretty far fetched to me." To The Oilholic, it seems the Saudis want to see how demand goes in the early part of 2016, before possibly backing a cut. Were that to be the case, the good folks in Riyadh reckon they would quite literally get more bang for their bucks. For the moment, don’t expect much, as yours truly reported for Sharecast. In the interim, here’s the current mantra of OPEC’s Middle Eastern producers, as one wrote for Forbes – i.e. discount the competition to death. Either way, there appears to quite a bit of intraday short covering going on at moment, which to me suggests the market is bracing for a no change scenario here in Vienna, before an almighty cry of “Short, baby short” once OPEC actually confirms that it will not be cutting. That’s all for the moment from Vienna folks, plenty more from here shortly! In the interim, keep reading, keep it ‘crude’! The Oilholic reckons it will take at least another six months in the New Year to ease the current oil oversupply glut. More so, as OPEC is highly likely to maintain its current production level, according to initial conjecture here in Vienna, Austria with the latest oil ministers’ summit currently underway. That would probably take us to somewhere around June 2016, when we’ll see excess supply falling to somewhere in the region of 1 million barrels per day (bpd). Be that as it may, even such a decline might not be enough to bring the so-called risk or geopolitical premium into play. Last week, offered a clear case in point when the Turkish Air Force brought down a Russian fighter jet. Both countries are significant players in the oil and gas world – Turkey, is a custodian of the key shipping artery of the Bosphorus, and Russia, is the world’s leading oil and gas producer. Yet, an oil futures "rally" in wake of the incident barely lasted two sessions and a few dollars, before oversupply sentiment returned to dictate market direction as per the current norm. Furthermore, both Brent and WTI futures are going sideways in the $40-45 per barrel range, as has been the case of late. Flashpoints in the oil and gas world haven’t disappeared. Nigeria, Libya, West’s relations with Russia and Iraq are broadly where they were, if not worse. In fact, situation in the wider Middle East is pretty dire. Yet, the risk premium - so prevalent in the oil trade - is more or less nonexistent in a market struggling to park its barrels. That will remain the case until excess supply falls to around 700,000 to 800,000 bpd. 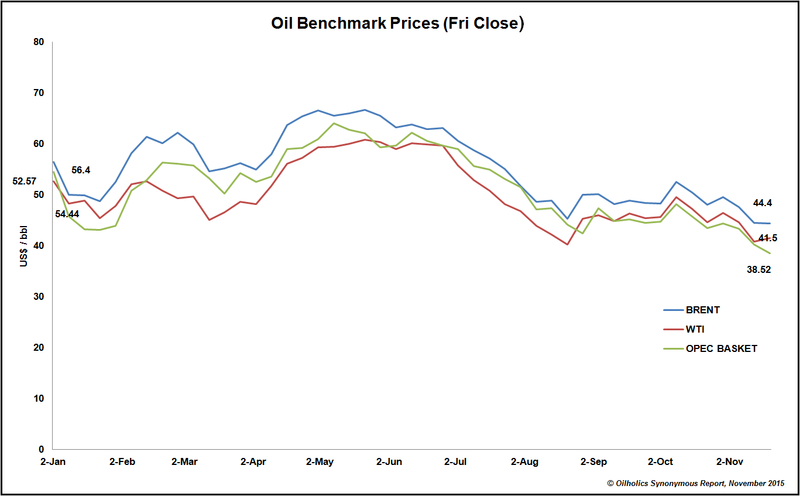 Even beyond the first half of 2016, few expect a dramatic uptick in oil prices, using Brent as a global proxy benchmark. At Fitch Ratings’ recent London Energy Seminar, this blogger found himself in the company of several experts who agreed that $60-level is unlikely to be capped before the end of 2016. Alex Griffiths, Head of Natural Resources and Commodities at Fitch Ratings, Tim Barker, Head of Credit Research at Old Mutual Global Investors, Julian Mylchreest, Global Head of Energy at Bank of America Merrill Lynch, and Mutlu Guner, Executive Director at Morgan Stanley, all agreed there is little around to instil confidence in favour of a fast uptick above $60 being on cards within 12 months time. Finally, a couple of notes from Moody’s are worth flagging. The agency recently changed Kinder Morgan's outlook to negative from stable. 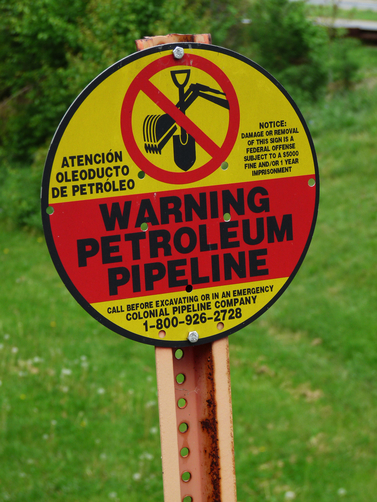 Senior Vice-President Terry Marshall said the negative outlook reflects Kinder Morgan's increased business risk profile and additional pressure on its already high leverage that will result from its agreement to increase ownership in Natural Gas Pipeline Company, a distressed company. On November 30, Kinder Morgan announced an agreement to increase its ownership in NGPL of America to 50% from 20% for approximately $136 million. Brookfield Infrastructure Partners will own the remaining 50%. Proportionate consolidation of NGPL's debt will add about $1.5 billion to KMI's consolidated debt. NGPL's trailing twelve month September 30, 2015 EBITDA was $273 million (gross). 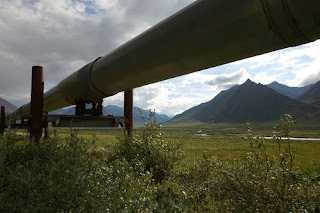 Moving on to state-owned crude giants, Moody's also said China National Petroleum Corporation's (CNPC) proposal to sell some of its pipeline assets is credit positive, as profits and proceeds from the sale will partially offset negative impact from low crude oil and gas prices and help preserve its financial profile during the current industry downturn. However, Moody’s said the sale has no immediate impact on its ratings and outlook as the benefits “are marginal, given CNPC's extremely large revenue and asset size.” Nonetheless, the ratings agency expects sale proceeds to help CNPC fund the gap between its capital expenditure and operating cash flow and therefore lower its reliance on additional debt to fund its growth. Finally, the rating agency also downgraded Pemex’s global foreign currency and local currency ratings to Baa1 from A3. Simultaneously, Moody's lowered Pemex's baseline credit assessment (BCA), which reflects its standalone credit strength, to ba3 from ba1. The actions were prompted by Moody's view that the company's current weak credit metrics will "deteriorate further in the near to medium term. The outlook on all ratings was changed to negative." That’s all for the moment folks from Vienna folks, as the Oilholic finds his bearings at yet another OPEC summit. Plenty more from here shortly! In the interim, keep reading, keep it ‘crude’! © Gaurav Sharma 2015. 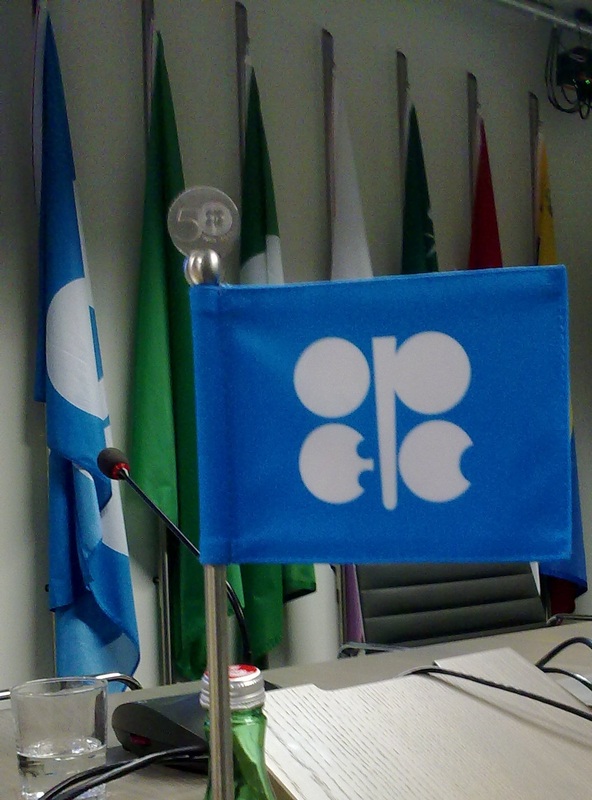 Photo: OPEC Signage © Gaurav Sharma / Oilholics Synonymous Report. 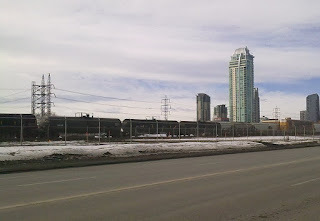 Having spent much of one’s career dabbling in the commodities sphere in general and the crude oil market in particular, the Oilholic, while not claiming to have any doctorate in gold matters, is nonetheless fascinated by the unique appeal of the shiny yellow metal passed down the ages, stretching from ancient to the modern world. Gold, one humbly suggests is the ultimate fool’s commodity. Excepting industrial use, it is bought and sold for one purpose alone – selling for more than the purchase price coupled with a lust in many, perhaps all, cultures for wanting more of the stuff. This lust triggered the desire to colonise others and several gold rushes in the history of mankind. While California’s Gold Rush of the late 1840s is the stuff of legends, human history is littered with other gold rushes. However one enduring legend, born here in Colombia, transcends all others and epitomises this lust – that’s the myth (or is it) of El Dorado. 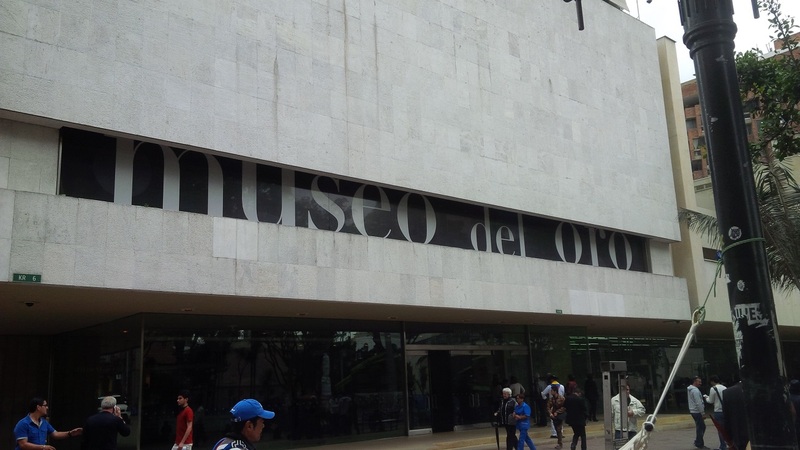 The Oilholic, out of morbid curiosity and certainly not wanting to miss out on Bogota’s splendid Museo del Oro, decided to dedicate his entire last day in South America towards probing the local legend that’s all too international. Scholars in the Colombian capital say that while toughing it out with the Incas in the 1530s, the Spanish Empire and its conquistadors started hearing tales about a tribe of natives high in the Andes Mountains where gold was much in abundance. When the tales reached Spanish royalty, conquistador Gonzalo Jiménez de Quesada was dispatched to lead an expeditionary force into the Colombian highlands. Upon gaining their first territorial victory in 1537, among the first pieces of local intelligence to reach the ears of Jimenez de Quesada’s soldiers was an ever more detailed narrative about that "Land of Gold." Conquered Musica Indians told the Spanish that on the shores of Laguna de Guatavita or Lake Guatavita (35 miles northwest of modern Bogota) once lived a chieftain who periodically covered himself in gold dust during religious ceremonies and festivities, and then dived from a raft into the lake shedding the riches, as depicted here in an ancient artwork on display at the Museo del Oro (see left). On each occasion, natives then threw gold, emeralds and precious jewels into the lake to appease a mythical god that lived underwater. Jiménez de Quesada’s men were told the ceremonies ended by turn of the 15th century, when the chieftain was killed and his subjects conquered by another Musica tribe some 50 years before their arrival. 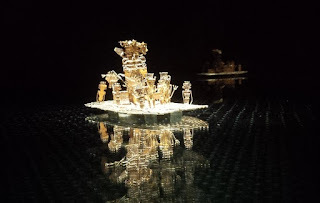 Part convinced by the tale, seeing locals displaying a liking for gold trinkets, and the promise of untold riches, the Spanish named the late Musica chieftain “El Dorado” or “The Golden One” and set about finding the lake. With their conquest of the Colombian highlands complete, the Spanish finally located Lake Guatavita having dedicated lives, limbs and their local loot to the cause. The Spanish Crown ordered the lake to be drained by “all resourceful means”. Given the year was 1545, with all the resources of the time, Jiménez de Quesada’s men could only lower the water level to dabble at the edges of the lake. A few hundred pieces of gold were indeed found, but Colombian and Spanish historical archives suggest there was no mass discovery. Furthermore, even if all of the gold was in deeper waters of Lake Guatavita – it was beyond human reach at the time. After the death of Jiménez de Quesada in 1579, businessman Antonio de Sepúlveda took on the mantle of draining Lake Guatavita. In their previous attempt, Spanish soldiers could only muster three metres worth of drainage, but de Sepúlveda’s men managed 20 metres. At a great cost and further loss of lives, they found more gold but nothing on the scale the Spanish crown was hoping. Meanwhile, the legend of El Dorado and riches of the “new world” reached other European colonial powers. The English, Dutch and Portuguese all vowed to beat the Spanish to it. Better still all three, and even the Spanish at a later stage, concurred from the lack of success at Lake Guatavita that the promised gold paradise must be “somewhere else in Northern half of South America”, as it was the part of the continent they had encountered natives with a penchant for gold, and a breathtaking array of ornaments. The legend of El Dorado got the era’s poster child in the form of adventurer Sir Walter Raleigh; trusted lieutenant of Queen Elizabeth I of England and purveyor of tobacco, another commodity unknown to his homeland before he introduced it from one of his many travels. Like his colonial peers, Sir Walter failed in his attempts to find the Land of Gold (that he often confusingly labelled "City of Gold") first in 1595 and then 1617, which in his opinion was somewhere in modern Guiana. Instead, he lost both his son (Watt Rayleigh in battle) and his head, having miffed King James I for starting a skirmish with the Spanish against the English monarch’s wishes. "Shadow," said he, "Where can it be - this land of Eldorado?" Ride, boldly ride, the shade replied – "If you seek for Eldorado!" The last such recorded attempt, a source of much disdain in Bogota, was in 1898 when British expatriate Hartley Knowles’ company – Contractors Ltd – drained the Lake Guatavita so low that only mud and slime was left rendering it impossible to explore when sludgy. Subsequently, the mud baked in Colombian sunshine all that was left was nature’s version of concrete. Having wasted millions and destroyed the area, all the nutcases could find were a few trinkets that fetched £500 at a Sotheby’s auction back then, and can be seen today at the British Museum! 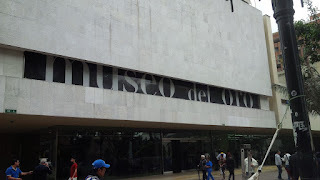 A much more impressive collection, should gold be your thing, can be found at the Museo del Oro (see examples on the right). Thankfully, Lake Guatavita was declared a protected area in 1965. Nature and rainfall restored some of its lost beauty in subsequent decades, after years of greed and pillaging ruined it. Private salvage, let alone draining the Lake, are now illegal and punishable by a custodial sentence, one is informed. And well, no gold discovery on the scale of 15th Century projections put forward by Sir Walter and others was ever made. Yet the El Dorado legend and mankind’s attraction for the shiny yellow metal remains undiminished. Each time another asset class feels the squeeze or a currency gets shorted, headlines about “investors plying into gold” emerge with every price decline or uptick duly reported. From Hollywood blockbusters to the Indian Wedding Season, star-crossed lovers’ offerings to central bank vault deposits, gold and its lure is all around us. Mankind it seems has never stopped looking for El Dorado in some way, shape or form! On that note, the Oilholic must board flight AA1122 from his El Dorado; Bogota’s international airport in the small hours of the morning. That’s all from South America folks. It’s been a fascinating few weeks in this vibrant continent. Next stop Dallas, and then on to London Heathrow. Adiós América del Sur; adios Colombia! Keep reading, keep it ‘crude’! © Gaurav Sharma 2015. Photo I: Museo del Oro, Bogota, Colombia, Photo II: El Dorado legend gold sculpture at Museo del Oro, Bogota. 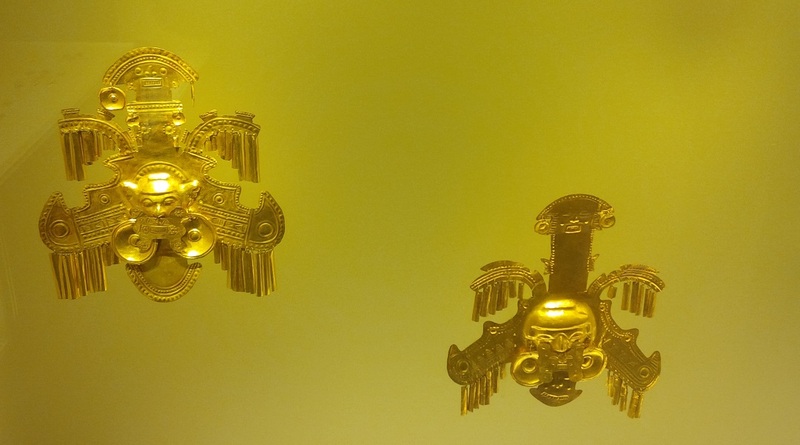 Photo III: Ancient gold ornaments at Museo del Oro. 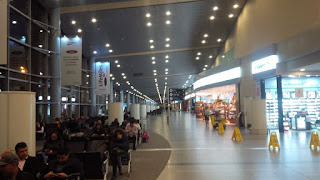 Photo IV: El Dorado International Airport, Bogota, Colombia © Gaurav Sharma, October 2015. After a fascinating two weeks travelling around South America, the Oilholic is back where the journey on the continent started in Bogota, Colombia, before heading back to London. 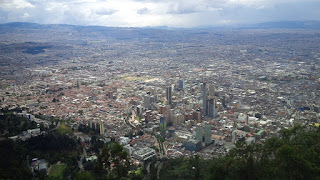 In using the Colombian capital (seen on the left from Mt. Monserrate) as a starting point, this blogger wanted to both feel first hand as well as write about how far this country has come following five decades of armed conflict resulting in a tragic human and socioeconomic cost, above all else. More so, as peace is finally getting a chance in 2015. In September, President Juan Manuel Santos inked a preliminary agreement with the Revolutionary Armed Forces of Colombia (or FARC). After three prolonged attempts since the 1980s by successive Colombian governments to broker peace, the recent accord appears to be the best chance for achieving that objective. Despite being the first president in decades to have an upper hand on FARC thanks largely to a heavy military build-up under his predecessor Alvaro Uribe, Santos staked his presidency on finding a solution to end the violence through peaceful means, though not at any cost. Reaching an agreement depended on FARC doing jail time, as demanded by the court of public opinion so heavily traumatised by violence perpetrated by the rebels over the years on a daily basis. On that front there is some dissatisfaction with the proposed deal. While the finer points are still to be worked out over the next six months, the Santos administration and FARC have broadly agreed that foot soldiers of the militant outfit would receive amnesty, but its leaders charged with “serious crimes” will face a special tribunal that would include foreign judges alongside Colombian ones. Those FARC operatives who cooperate and confess to their crimes would receive lighter penalties including five to eight years of community service with restriction on movement, but not prison time in the strictest sense. However, those who do not cooperate could go to jail for up to 20 years. A judicial framework along similar lines would be applied to right-wing paramilitary forces and their supporters. In return, FARC, which still has over 6,000 combatants, has also agreed that the rules will only apply if they give up their weapons. The significance of the deal cannot be overstated even if public demand for stricter penalties on FARC is not being met. From M-19 to the still active ELN, Colombians have seen too much death and destruction, and the dark side of human conflict that no one needs to see. Among the many expressions by Colombian artists summing up the tragedy of conflict within the country's borders, the Oilholic was privileged to see the late Alejandro Obregón’s Muerte a la bestia humana (Death to human beast) on display at the National Museum of Colombia in Downtown Bogota. 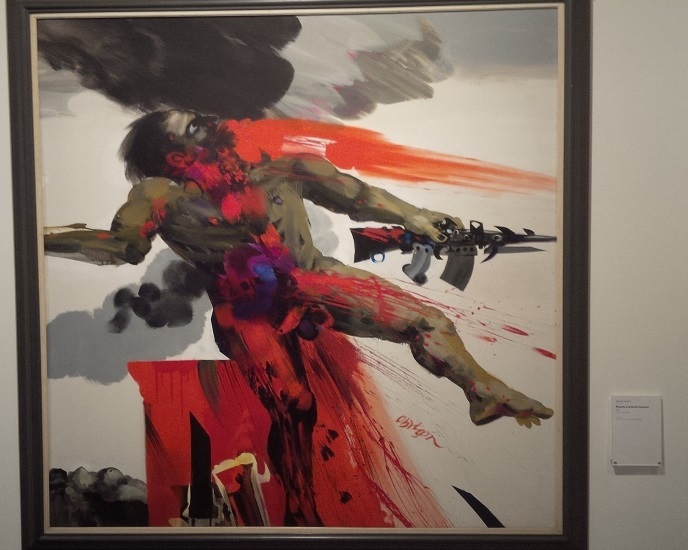 Friends here in Colombian capital say the painting (see right) was Obregón’s expression of disgust at those responsible for the kidnapping and gruesome murder of Gloria Lara de Echeverri, a government official abducted in June 23, 1982. Her body was found five months later on the steps of a church. While a FARC faction was alleged to have been behind the act, the case was never fully resolved and remains a source of debate to this day. For Obregón and his peers in the art community, Gloria Lara, like several of her countrymen and women were innocent victims who deserved better but lasting peace, bar the odd ineffective ceasefire aside, could not be brokered. So if an imperfect deal now offers a chance for peace, then it needs to be looked at. FARC knows its back is against the wall and has as much of a vested interest in making the deal work as the Santos administration. Things are changing in Colombia. While every life is precious, and 600 Colombians civilians were lost to conflict last year, 2015 has so far been the year to see the fewest deaths to armed conflict since 1985, according to local data. While there is petty crime and gun violence in Bogota, it is no longer the kidnapping capital of the world, like it was back in the 1980s. Beleaguered FARC’s ire has been directed more towards near daily attacks on Colombian infrastructure, mainly power lines and oil pipelines. 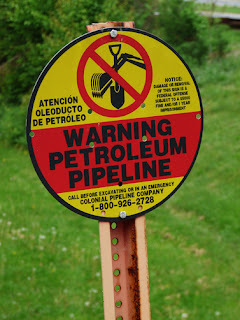 One recent attack resulted in 15,000 barrels of crude spewing into a river. April saw heated exchanges of fire between government forces and FARC. However, while talks were progressing the skirmishes diminished in frequency and ferocity. It now remains to be seen, if the agreement holds, and Santos has said the Colombian people will have their say on the final agreement. The visible human tragedy aside, disruption caused by conflict lowers the country’s GDP by 15% to 20% per annum according to some estimates. It appears a chance to change that is on the horizon. Here's hoping it holds. 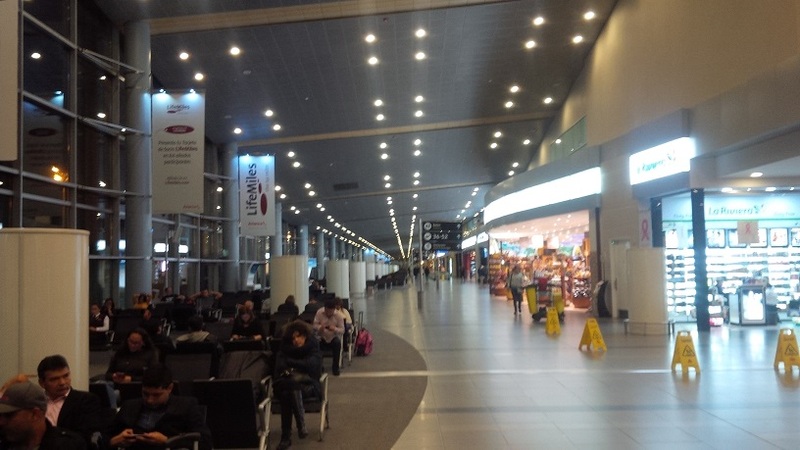 That’s all from Bogota for the moment folks! Keep reading, keep it ‘crude’! Bidding Adiós to Buenos Aires, the Oilholic has landed in the bursting metropolis of Sao Paulo, Brazil, one’s penultimate stop in South America before returning to Bogota and flying back home following a two week trip to South America. Walking down the city’s vibrant Avenida Paulista, a 1.75 mile thoroughfare that has several businesses, financial and cultural institutions (including the Museu de Arte de São Paulo), glitzy skyscrapers, malls, hotels and shops lining up either side of it, one gets a real buzz of modern Brazil. However, the country’s President Dilma Rousseff would get a largely unwelcome buzz were she to walk down the avenue. Most in Brazil’s commercial heart lay the blame for the Petrobras corruption scandal, uncovered earlier in February, firmly on Rouseff’s door even tough she has not been directly implicated in anything uncovered by corruption investigators so far. There have been several mass protests here in Sao Paulo, along with Rio de Janeiro and other major Brazilian cities calling for the President to be impeached. As the Oilholic noted earlier this year in a Forbes column, the scandal has politically scarred Rouseff, a former chairwoman of Petrobras’ board of directors, beyond repair in the unforgiving world of Brazilian politics. Many of those facing investigations and jail time happen to be from her side of the Brazilian political spectrum – the Workers’ Party. That’s what fuels people’s anger. 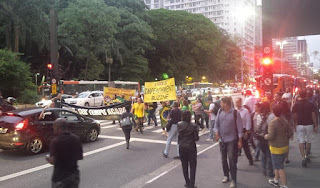 Mass protests grab headlines, but sporadic smaller protests – like one this blogger witnessed on Avenida Paulista – are commonplace (see above left). For people who call the Americas third-largest oil producer behind the United States and Canada their home, Petrobras has always held a special place in hearts and minds. So to see it humiliated on the world stage and financially wounded by a corruption scandal plays on peoples minds in a struggling economy. In global terms, according to BP’s latest statistics on the industry, Brazil is the world’s 9th largest oil and gas producer pumping out some 2.95 million barrels per day, with Petrobras as its custodian. However, weak economic growth and the scandal implicating several high profile people at Petrobras has reduced the chances for production growth over the short term; at least of the kind that was hoped for back in 2010 according local sources. Clearly, going by the mood in Sao Paulo, not many want to let Rouseff off the hook, whether rightly or wrongly. That’s all from Brazil folks, as one leaves you with a view of the magnificent Catedral da Se de Sao Paulo (above right). Keep reading, keep it ‘crude’! © Gaurav Sharma 2015. Photo I: Anti-Dilma Rousseff protests on Avenida Paulista, Sao Paulo, September 23, 2015. 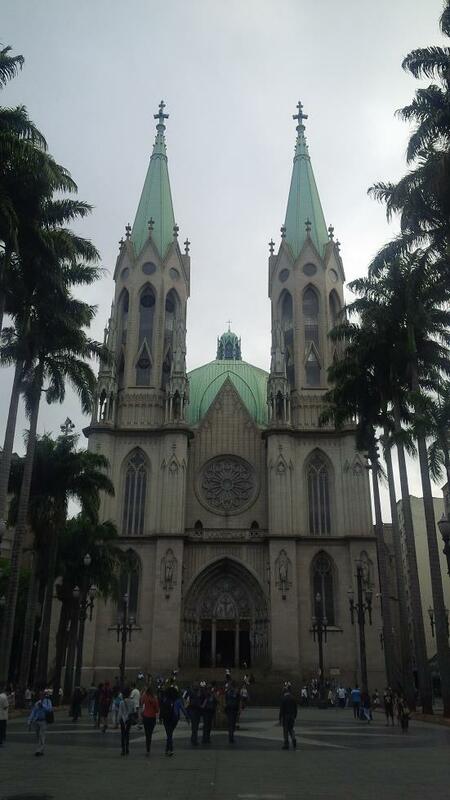 Photo II: Catedral da Se de Sao Paulo, Brazil © Gaurav Sharma, October 2015. The Oilholic has hopped over from Santiago de Chile for a splash and dash pre-election visit to the Argentine capital of Buenos Aires. 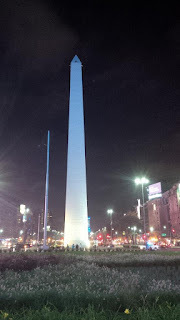 Braving fake banknotes, dodgy cab drivers, eateries where prices change daily and a services sector with few scruples if any, yours truly finds himself peeking at ongoing electioneering in the run-up to the October 25th presidential election, standing beside the Obelisco de Buenos Aires. In all likelihood, a presidential run-off looms for a successor to Cristina Fernandez de Kirchner, who claims to be leaving behind a “crisis free” country where of course inflation is close to 30% by unofficial accounts and the IMF expects the economy to shrink further. Centre-left candidate Daniel Scioli, handpicked by Kirchner (who cannot seek a third term under the constitution), is vying with centre-right man and Buenos Aires mayor Mauricio Macri. Not many in the Argentine capital, give the “third guy” Sergio Massa, a former ally of Kirchner's (before relations soured), much of a hope. However, his support – should a run-off happen – would be vital. The incoming president would have an almighty mess to deal with in a country that has the dubious title of slipping from being a developed economy at the turn of the previous century to a third world country in the 21st century. Both main candidates promise to lower inflation to single digits and stimulate growth. Some (but not all) in Buenos Aires are simply glad Kirchner would be gone. Discussing what shape the country’s energy policy in general (and oil and gas policy in particular) takes would be pointless before we know who the next occupant of the President’s office is. Much still remains at stake, including Buenos Aires’ continued hostility to offshore oil and gas exploration in the Falkland Islands (or Las Malvinas) as the Argentines call it, given the history of the territory. Despite Kirchner’s whinging to deflect attention from internal political woes, oil and gas explorers in the contentious British territory, claimed by Buenos Aires, are not going to go away. If anything, the oil price decline, rather than something Buenos Aires does, is likely to have a bigger impact on future prospects. Away from the contentious side issue, it’s the direction of Argentina’s shale exploration that’s of a much bigger significance in a global context. As the US Energy Information Administration noted earlier this year, if you exclude the US and Canada – only Argentina and China happen to be producing either natural gas from shale formations or crude oil from tight formations (tight oil) at an international level. How the country’s promising Neuquen Basin develops further would have a massive bearing on the economy. But where we go from here, given for instance the Repsol versus Federal Government histrionics of the past, would be anyone’s guess. The Oilholic intends to probe the subject more deeply at a later stage both on this blog as well as for Forbes, once we know who the next Argentine president is. However, for the moment, that’s all from Buenos Aires folks. 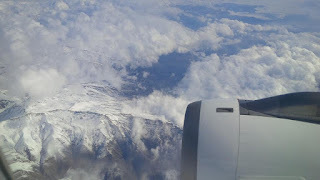 Yours truly leaves you all with a breathtaking view of the Andes Mountain range as seen from LAN Airlines flight 1447 coming from Santiago de Chile to Buenos Aires (right). Keep reading, keep it crude! Update, October 26th: With 96% of the votes counted, according to the AFP, Scioli was marginally ahead with 36.7% of the vote, while Macri had 34.5%. Massa, who came a distant third has accepted defeat but not stated who he would be supporting. A presidential election run-off has been scheduled for November 22.